Fly Eradication Regulations or access them through the State Law Publisher website by clicking here. 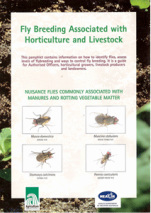 Click here to download and read the latest issue including information on stable fly breeding, the upcoming total ban of poultry manure and the results from the Gingin entomology consultancy. Click here to download the article Elkan, P., R. Parnell, et al. (2009). "A die-off of large ungulates following a Stomoxys biting fly out-break in lowland forest, northern Republic of Congo." African J. Ecol. 47(4): 528-536.